When voters go to the polls on Sunday to elect Japan's powerful lower house of parliament, only one out of every six candidates will be a woman. That is despite the fact that Prime Minister Shinzo Abe has repeatedly proclaimed his desire for Japan to be a country where women "shine", where they would hold a third of all top jobs by 2020, and despite the fact that almost as many women as men will be voting. "I don't see it being discussed at all as a focus of the election," said Kaori Sasaki, president and CEO of consulting firm ewoman. Abe called the election last month, just halfway through a four-year term, labelling the vote a referendum on "Abenomics" -- his signature blend of monetary easing, fiscal largesse and promised structural reforms. While there is now plenty of easy money floating around and the stimulus taps are wide open, the work of reform -- including making it easier for women to combine a career and a family -- has barely begun. The last two years have been big on prime ministerial rhetoric about getting rid of the glass ceiling, including the goal of getting women into 30 percent of senior positions by the time of the Tokyo Olympics, but short on results, said Sasaki. "He may no longer be prime minister in 2020, which makes it a bit unclear if he is seriously committed to achieving that target," she said. In the current 480 seat lower house of parliament, just 39 seats -- eight percent -- are held by women. That places Japan 129th out of 189 countries in a ranking compiled by the Inter-Parliamentary Union, a Geneva-based organisation of parliaments. By comparison, 45 percent of Swedish lawmakers are women, 23 percent in Britain and 20 percent in Saudi Arabia. And the gender balance in the Japanese parliament isn't about to get a great deal better. Abe's ruling Liberal Democratic Party (LDP) is fielding women in less than 12 percent of the seats they are fighting. Overall, 198 of the 1191 -- 16.6 percent -- of the candidates in this election are women, and none of the main parties is led by one. This, say critics, feeds into an atmosphere in the governing classes where sexism is endemic. Just last week, Finance Minister Taro Aso was forced into an apology after saying "people who don't give birth" are at the root of Japan's ageing society. That came after an episode earlier this year that grabbed attention around the world when a young Tokyo assemblywoman was heckled during a debate on helping the city's mothers. Shouts of "Why don't you get married?" and "Are you not able to have a baby?" erupted in the chamber as Ayaka Shiomura spoke. One LDP man apologised in public, but others who took part were never identified. Economists have been saying for years that Japan needs to make better use of its well-educated but underemployed women, and could go a long way to plugging its labour gap if more of them worked. While women are well represented in badly-paid, part-time work, a mere 1.2 percent of executives at 3,600 listed companies are female. In speech after speech, Abe has urged the country to open up to "womenomics", encouraging some of Japan's biggest firms -- including Toyota, Panasonic and All Nippon Airways -- to announce targets for boosting the number of female executives. For political lobbying group Ikareru Joshikai ("The Angry Girls Group") the prime minister's talk of womenomics is patronising lip service. "Abe's government is trying to use women either as some sort of icing on a cake or as a tool to get the economy going," said Mizuho Nakayama, 44. For fellow mother Yuko Takato, 38, there needs to be some wholesale reforms of Japan's male-dominated working environment. "It remains difficult for women to climb the career ladder and have children when companies have no systems to help, and there is no real support from the country," she said. But for ewoman's Sasaki, having a prime minister who will even talk about it is a good start. "Members of the LDP are primarily very conservative" and reflect Japan's traditionally paternalistic values, she said. 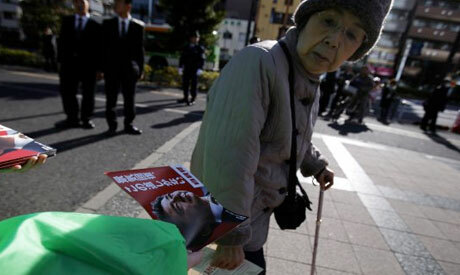 "I don't want to discourage Abe by criticising the whole campaign. It is epoch-making that the prime minister keeps speaking out for this cause."